Hardball is a fresh, fish-out-of-water comedy. 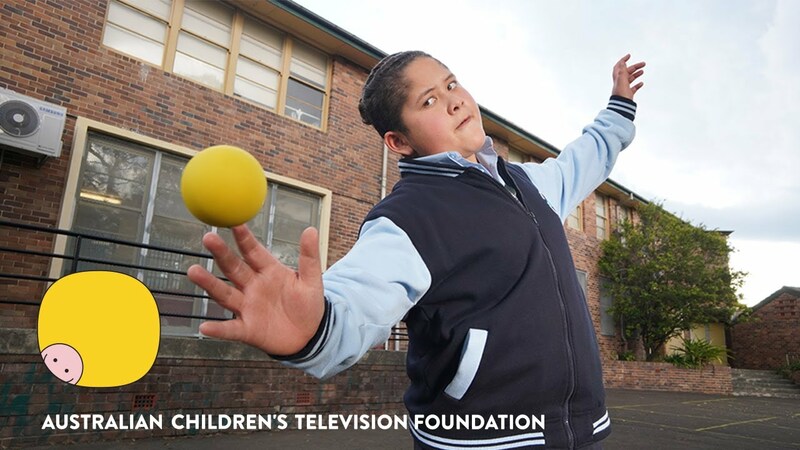 When Mikey moves from New Zealand to Western Sydney, he finds himself in the thick of the ultra-competitive, schoolyard game of handball. After saving a kid on the playground from a wayward ball and finding he has the powerful strike in the world, Mikey is befriended by Jerry and Salwa, who join forces to train him to become a weapon of precision and skill - equipped to topple resident king of the court, Tiffany, and take home the Western Suburbs handball crown - if only he could make the ball land in the right suburb! A series with lots of heart and humour, can Mikey go from zero to hero, in the quest to be the best in the west? When Mikey’s daddy scores a rugby league contract, he upends their lives in New Zealand, plonking them in Western Sydney. Mikey starts at his new school mid-term and at lunchtime on day one, discovers handball. Tiff loses a handball battle to Salwa, so she uploads an embarrassing video of Ms Crapper dancing - and frames Salwa. Salwa is banned from handball at school: Mikey isn't sure about going back-up for Salwa in the tournament. Bullfrogs footy stars visit school and Daddy is their new recruit. A badly aimed handball from Salwa gets her banned from SASI-WESTS-HAT when Ms Crapper gets sauced, literally. Jerry's Maori legend lie gets Mikey on board. Handball training reveals Mikey's epic power, but his aim needs serious work. Jerry and Salwa join forces to coach him. The trio try to pin the video recording to Tiffany by finding her phone in lost property. Jerry and Salwa lock horns training Mikey. Daddy has his footy debut. Ms Crapper is in full Bullfrog regalia, Tiff’s there with her dads. Daddy misses an important tackle and Mikey cheers him up with some wise words. Auntie gets stuck in traffic at a suburban Lebanese wedding - just when Mikey needs her help so he can register for SASI-WESTS-HAT in person. An epic mission to find her is like being lost in the desert. Mikey, Jerry and Salwa head to the beach on the weekend in search of the elusive handball oracle, Z-Pop. They embark on a journey that sees Mikey forced to play the leader of a secret handball society. Mikey, Tiff and Salwa are invited to a workshop by world handball champion Gary Garrison. It's at Tiffany's posh old school and when Mikey tries to save her from a missile-like handball, Gary's trophy is in the firing line and so is the reputation of his school. Ms Crapper wants to ban Mikey from SASI-WESTS-HAT, but the kids create a makeshift court to decide if that should happen. Mikey feels betrayed by Jerry and Salwa, so tries to stay out of their way. Salwa confronts him and says Howie was a good lie, because it made him believe in himself. He's ready to quit SASI-WESTS-HAT. It's the day of SASI-WESTS-HAT. Everyone's there. Mikey feels a little overawed, so Jerry encourages him by drawing a question mark on his arm: it's Mikey's "Why". Who will take out the trophy and be crowned Best in the West?